That first one – they really do seem in a kind of agony, or perhaps in prayer. Is it perhaps something to do with the unusual choice of fabric wrapping them – one would expect synthetics, and instead to have sack cloth…it just evokes something human, medieval. I think you’re right Helen, it is like a sack cloth. Rather Medieval. The sadness these photos evoke goes right to my heart. The wrapped trees seem so human like. Fantastic photos. just love the effect created by the covers used and the surrounding snow. Great set of photos. These are so very evocative. Glad to see more of the wrapped trees. Just showed my son the first shoot yesterday. This grouping with it’s wider composition pulls at me much like refugees of winter’s brutality. Both shoots however, share an uncommon beauty. very intriguing and emotion provoking. artful! A pilgrimage of wrapped trees; looking to the next season. The trees seem to take on a life of their own in winter – the way you photographed them gives an other-wordly feeling. Excellent compositions! I do love the pair in the 3rd image. I’m not even going to start saying what I see, because they are so richly evocative and bizarre. I wonder where you live– it must be a very harsh place if even the trees need sweaters. It does get a bit harsh in winter. 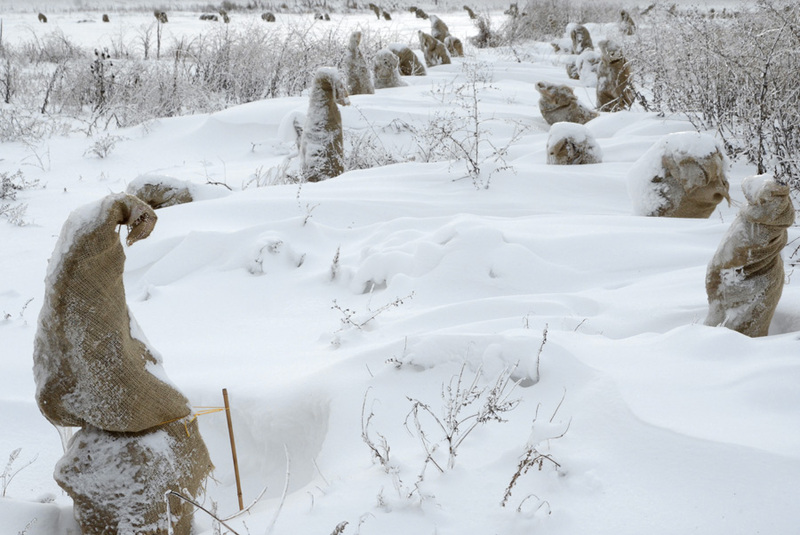 The story behind the “sweaters” is that they are newly planted trees along a highway, wrapped to help them survive their first winter in harsh conditions. Wow, these are really striking. Someone up above mentioned a pilgrimage and that’s exactly what I thought of too. The fourth picture is my favorite. That’s the one that looks most like people on a march, just beautiful. These are remarkable images, keenly observed and presented as hauntingly beautiful compositions. At the same time, for me, there is an intense sadness. I see prisoners or refugees exposed to harsh conditions. 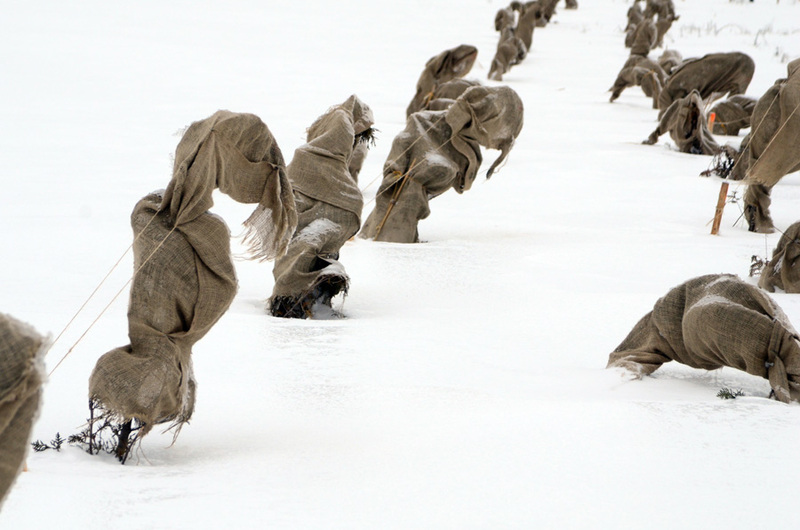 They have no freedom of movement – their limbs are bound, their identity lost, and they are reduced to a shuffle. The wire fence in the first photo indicates their confinement. These are very fine photos, beautiful but challenging. Wow, these are incredible.. they tell such a story.. it moves you. Such wonderful images. Haunting and beautiful and the same time. Oh, mystical refugees frozen in time.. They really look human !!! Most people wouldn’t even think to look twice at these, I don’t think. You’ve got a creative eye, though. It is a little heartwrenching. They look like prisoners. Fantastic shots! Very beautiful and I just love the feel to these shots. I agree – they look human in a way. Love how they all look different. 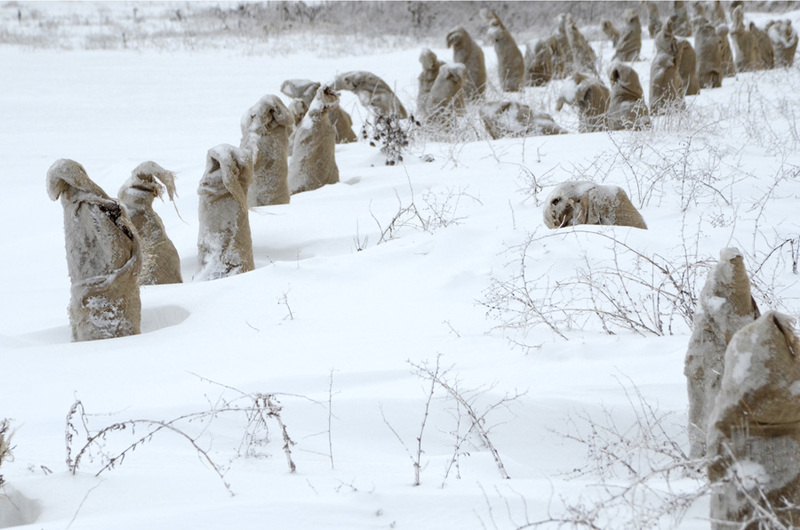 It must be the most bizarre landscape I ever seen. Far stronger any conceptual art installation or situationist play. Even the tree themselves couldn’t withstand their natural climate ? Or see it as a warm hearted human activity ? Or stranded monks or pilgrims in the wild ? —– I lost a word. They do look very strange don’t they. Like they have taken on a life of their own. 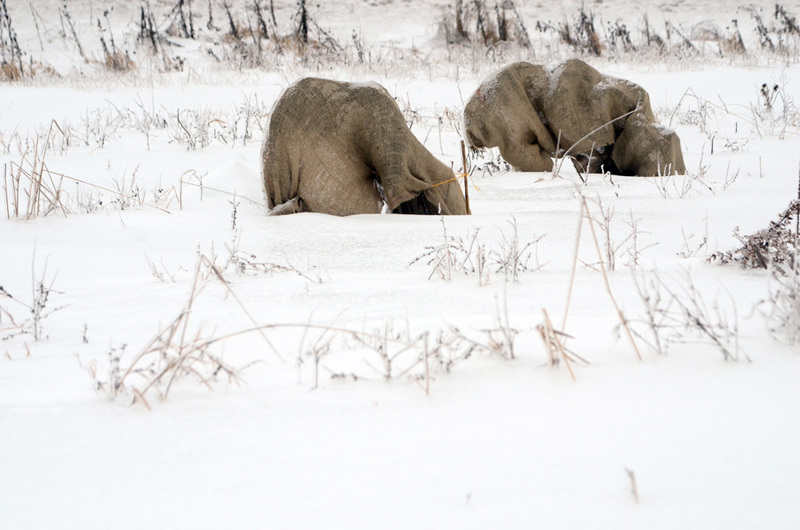 They are wrapped to protect them from their first harsh Canadian winter along a highway. amazing shots , thoughts provoking ones as well. We know they are trees, but they look little human statues. Spellbinding photos. Karen, these are absolutely haunting. Looks like a concentration camp, especially the third one with the fence and the dark line behind. Very strong. Wow! These wrapped trees are so lifelike. Or deathlike? And you’ve captured them beautifully, Karen. These photos are incredible, Karen! Emotional for sure! Heart rending.. If you remember Karen on your first post I mentioned that I thought they looked like Irish potato famine survivors…this reminds me of that even more…or of concentration camp victims…or the long march.. the most extraordinary photos..
Oh my! What a wonderful series, Karen. These are so eerie. They look so much like people it’s uncanny. Beautiful too! Bravo! I can’t stop looking at them! They look like people in some awful biblical disaster or something. I find them so intriguing myself. I keep thinking about going back to photograph them again. I’m fascinated by other peoples interpretations. 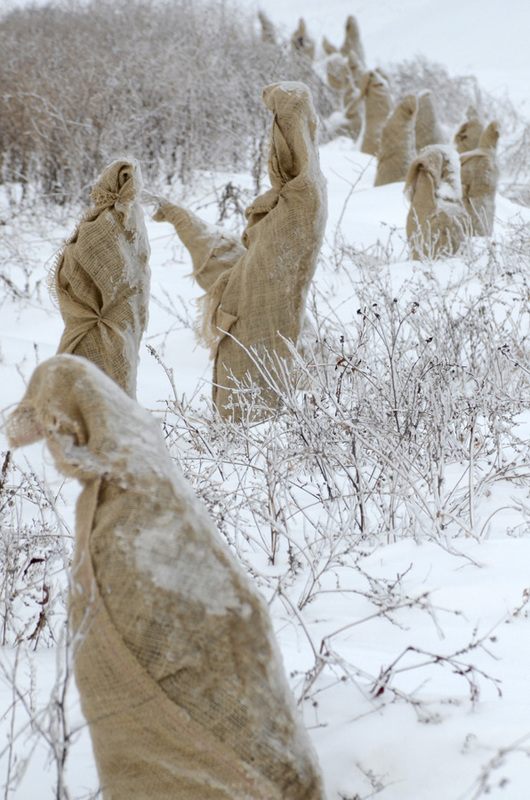 And I mean dead people wrapped around with burlap and impaled on sticks as some sort of a sick human sacrifice. Haunting and beautiful at the same moment. The “figures” seem to want to move off the page but are frozen and tied down. There’s a subtle hint of longing in them. They look as if they’re waiting for something. Oh lots on the cutting room floor! Although a lot of those are interesting too. I find it hard to look at them and think trees. they seem to have morphed in my mind for sure. I hadn’t thought about going back at night, interesting idea…. Beautiful, haunting photos! I like the third one where the details of the frost on the burlap are visible. And it’s amazing to think that trees wrapped in cloth can evoke so many associations with hardship, agony, longing, despair. Wonderful work. Thank you, it’s interesting to see peoples responses. 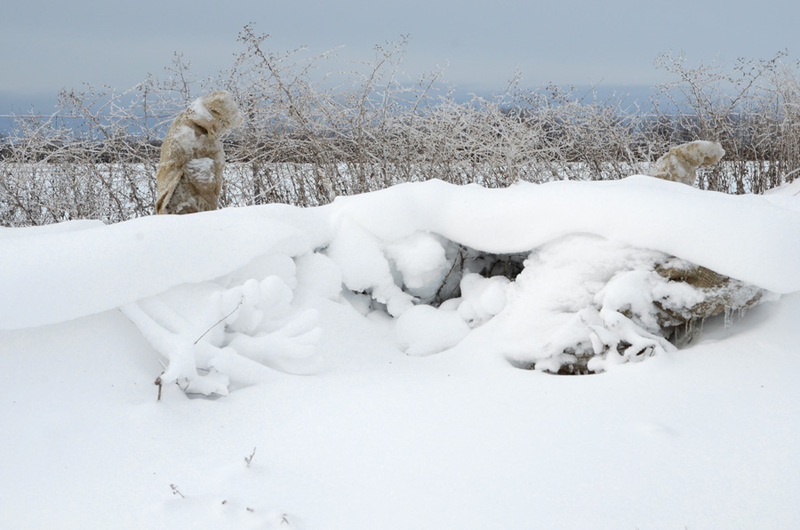 they look like people wrapped up against the elements very evocative. So creepy! You’ve set the scene perfectly. I can almost hear the winter wind whistling and see the angry dark clouds sneaking in behind you…like a scary movie. Really cool pics! I love when pictures provoke feeling. From an earlier comment by you, “Sleeping……” I’d like to add, “Sleeping Beauties” waiting…. Wow, Karen. These are even more spectacular than the first batch. 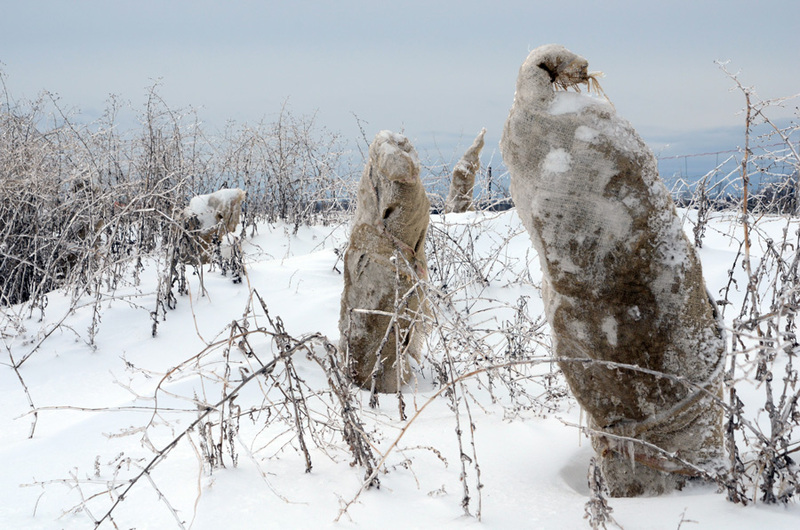 Some of them still remind me of penguins; others remind me of people bundled against the cold on a slowly plodding one behind the other on a pilgrimage. Those photos create so many emotions and isn’t that our goal to create emotions and not just beautiful photos. Amazing work and I can see why you are fascinated with them. I remember the first set. They really remind me of something from the Civil war. Figure lined up in a huddle. Perhaps it’s the material. these photographs are genius and what expressive photography is all about. Great photographs, Karen! They look like they are alive and taking refuge from the cold, huddling up the way they are doing! In some ways the images are disturbing because they look like suffering people – refugees, or like some of the images of Russian and German soldiers that came from the Russian Front during the 2nd World War! Poignant and sad in some respects! Isn’t it amazing how some photographs can lead you in all sorts of unrelated directions and/or produce emotional responses? I enjoyed the first photos that you published of these trees Karen and these are even better. So many interprertations including a seal colony among others. Superb. 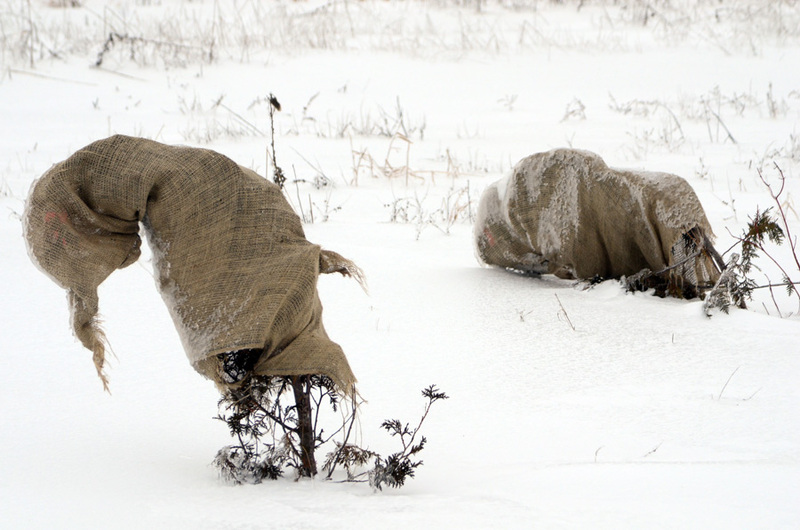 I love the countryside in a white coat, but these shrubs wrapped in blankets give me the impression of great suffering and I am thinking suddenly to the beautiful oleander in my garden in Normandy in France. I wonder if it was good to ask friends to cover it for winter and I wonder what he looks under his blanket. If he resists the cold this year, I think I will leave it to defend himself against the cold next year. They look like weary travelers in an inhospitable land. Outstanding series Karen, very life-like and figurative as you said. So many stories in there. Beautiful collection. 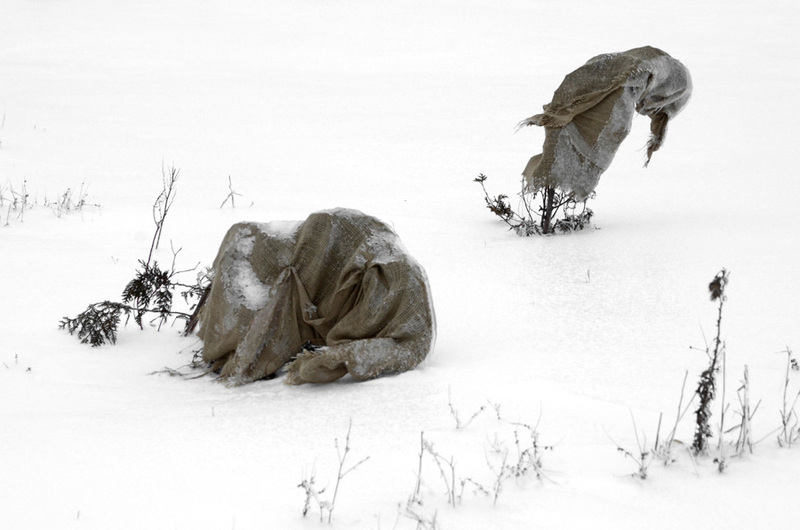 These are truly haunting – women bent in supplication springs to mind. And a fellow Canadian to boot! I love the story you’re telling with these images. Very imaginative! You’re so right about the first one! 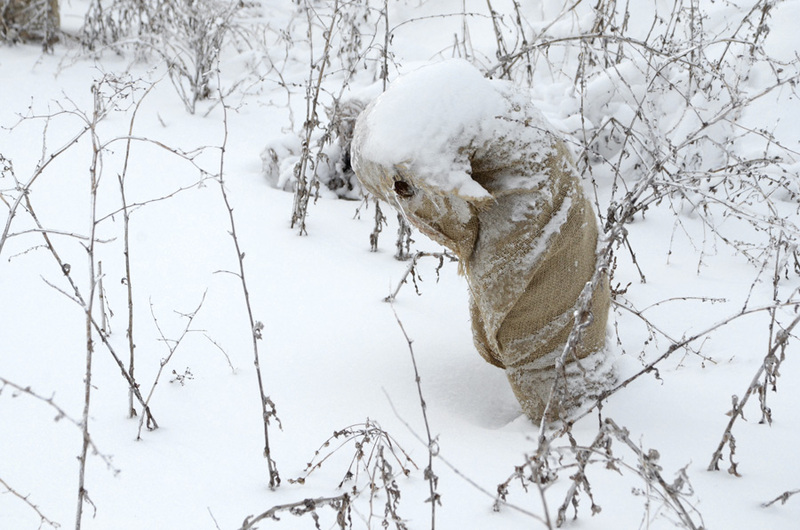 I always hated snow for being so harsh and …unkind! Yet I’m drawn into these photos like magnet! Amazing! at first I thought there are hidden humans. Ooh. Why didn’t I think of reblogging. well it seems good ideas come ideas come on Mondays. I was trying to explain to my sister in law (who is an artist in college) about your photographs. She is always on the go but looks at my blog. I know she will appreciate your pictures. I just couldn’t quite do your pictures justice with words. they definitely need to seen. cheers! These are interesting, but kind of creepy. I’ve never seen anything like this before. Thanks for sharing. Grat series! I can almost feel the chill off the computer screen! These are really awesome and powerful. I think we can all write our own scenario for what might be going on here. I think it will be really interesting to see how you might edit and group them once you have your stack of them. You were, of course. correct in that we don’t have them in this climate, but still I have never seen/noticed them in colder climates, and I certainly have never seen them photographed this way! I thought you had wrapped them. Now I see you found them that way. Yes, I would go back at dawn and dust and night and shoot. (Maybe you did and I missed a post. I think I may have one more post I haven’t found yet ) One day you will go there and they will be unrobed. You will need to photograph this development. too. Did you photograph them in raw? You could blow them up. They would make a spectacular exhibit. Has anyone approached you for a show? Maybe you could pursue that route. Galleries and museums could see them right here. Keep going with this series! Phenomenal images. So arresting and evocative. 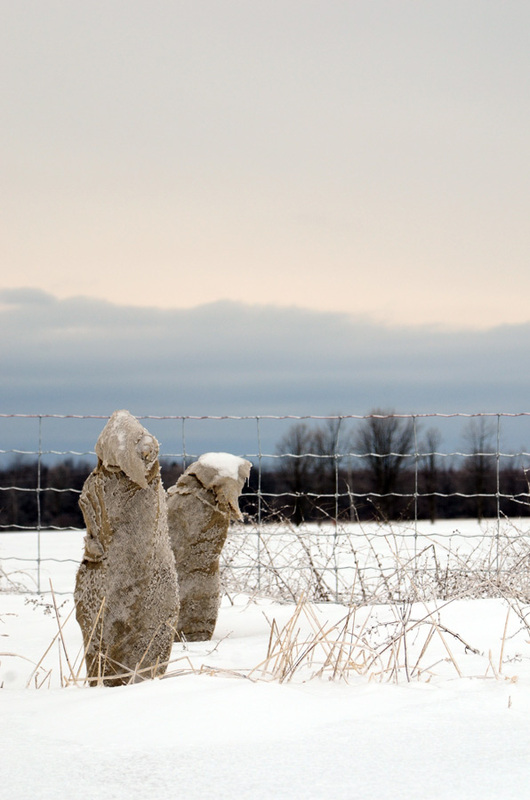 I agree – there’s certainly an element that like them to conceptual art or land art … but there’s an immediate pull that I find some conceptual work lacks. You have an amazing eye. Brill! Hi Sydney! Thank you for your very kind comment. I’m loving the conversations these “characters” spark. You are most welcome. They are ‘characters’ – absolutely! I’m finding the same sort of thing developing with the nest photos I’ve ben shooting for the past bunch of months; they have ‘personalities’ and evoke really strong, visceral reactions. Interesting how we respond to objects in the environment this way, yes? Back again to gaze on your trees Karen, it’s quite emotive really as I found this page of yours at the beginning of my photographic journey, and now we’re nearly a year on! Thankyou for being such an inspiration this year! May it be another great year for you. Another great year for you, too! I’m loving every bit of your work. Very moving images. What a wonderful interesting photo essay. Brings many emotions to mind.